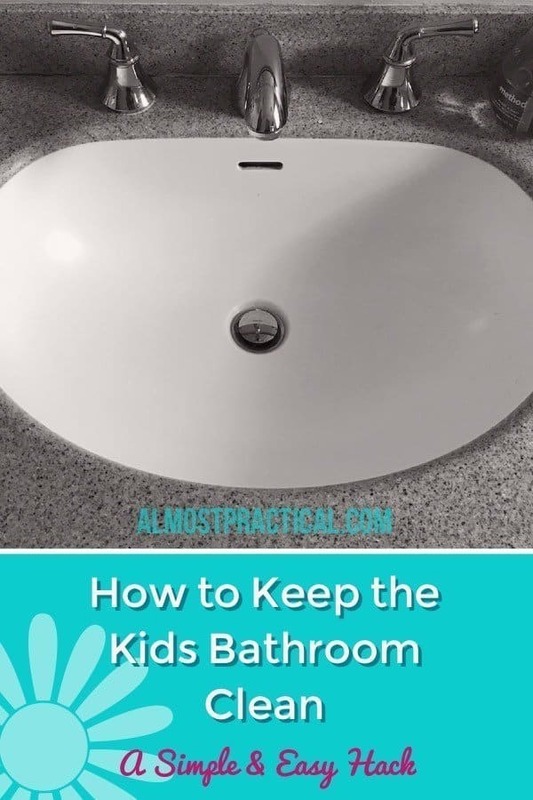 For years I struggled with how to keep the kids bathroom clean – and somehow I stumbled upon this simple hack. It's so easy, that I am kicking myself for not having done this a long, long, time ago. In our house, my four children share one bathroom. I use the term children loosely – because these kids are teenagers and young twentysomethings now. If it was hard keeping the kids bathroom clean when then were teeny, tiny tots, believe me, it is that much harder now that they are big children in adult sized bodies. Think beyond gobs of toothpaste – to daily contact cases, razors for shaving those scruffy faces, and beauty products – all the stuff that comes with teenagers. Whenever I ask any single one of them to clean the kids bathroom – they collectively say that someone else made the mess. Maybe we acquired an invisible child along the way – a very messy one at that? After awhile, as a parent, I just get tired of asking, strongly asking, yelling, and begging them to clean up the kids bathroom. So I end up cleaning it myself. Did you really want to see the before picture? What a mess! I know. I know. I should stand my ground. I've tried. When they are little, you have more options. You can go the “time out” route, the reward route, or the let's do it together route. But when they are teenagers – and really wonderful ones at that – I'm not up for punishments or allowance penalties. They're good kids. They work hard. They help me around the house and with errands. A lot. They just don't like to clean an overcrowded bathroom. The kids bathroom in our house gets a serious workout on a daily basis. I am sure that this never happens in your house. But in case it does – here is the solution. You'll be kicking yourself, too, when you see how easy it is. Do you have a towel holder in your kids bathroom? Or maybe it's a cute little towel ring hanging on the wall by the sink? Back in the day I loved putting out fancy hand towels to match the season. But you know what? A hand towel is great for drying hands – but not so much for cleaning a bathroom counter. Nor would you really want to use the towel that you dry your hands on to clean the sink. So, really what are kids left with? Nothing. put the dirty cloth in the laundry. So what else could they use to clean the countertop and sink in the kids bathroom? 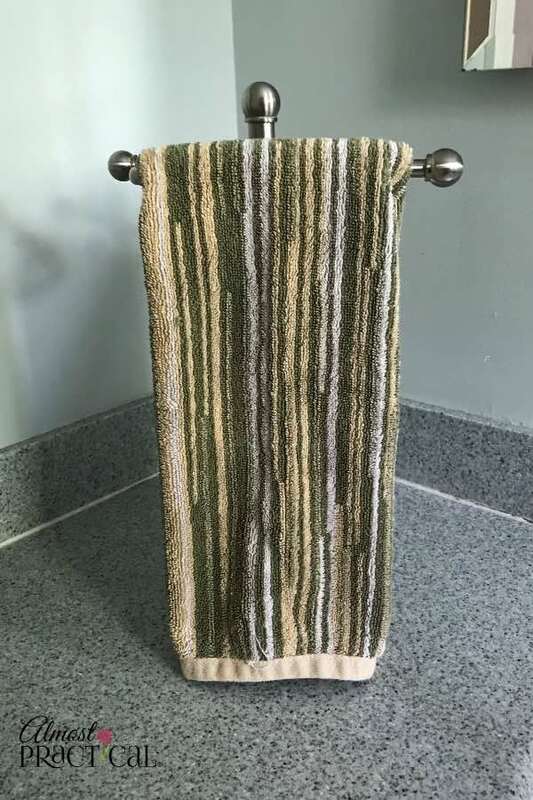 Replace the cloth towel with a paper towel holder. Yes – the kind you would normally put in your kitchen – like this paper towel holder from Amazon. But wait! That's not all. 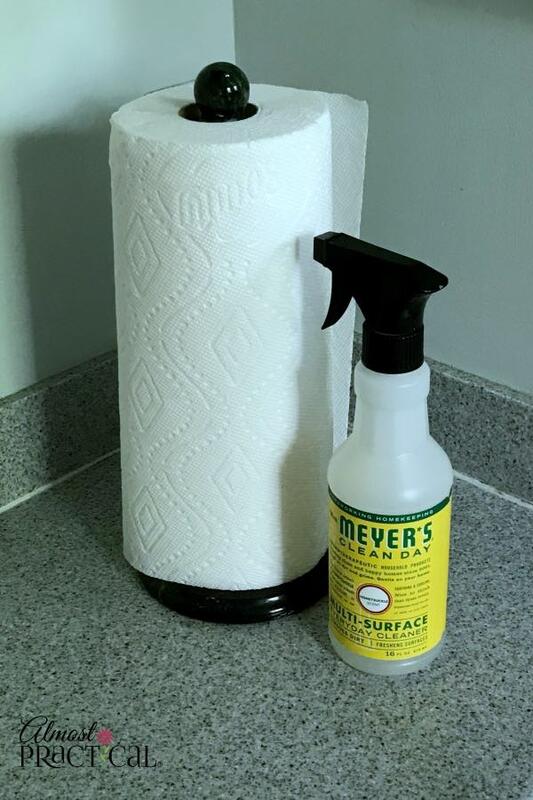 Next to that lovely paper towel holder, place a spray bottle of water or – if the kids are old enough – a cleaning solution. Make it something fun like this honeysuckle scented all purpose cleaner. It will make the room smell nice as well. Again, safety first – if your children are not old enough to safely use household cleansers, use water. It cleans up just as nice. I have been pleasantly surprised at the difference this simple change made. My kids actually wipe down the counter after they use the bathroom. And, if does start to get a little icky – it's super easy for me to go in and spritz the counter when the tools are sitting there. If you enjoyed this practical tip – won't you join the Almost Practical Organizing, Productivity, & Lifestyle Newsletter? Simply fill out the form below to subscribe. « What Does GTD Mean? And, no, it’s not a disease. Very good idea. Even adult should follow that for clean sink and counter top.